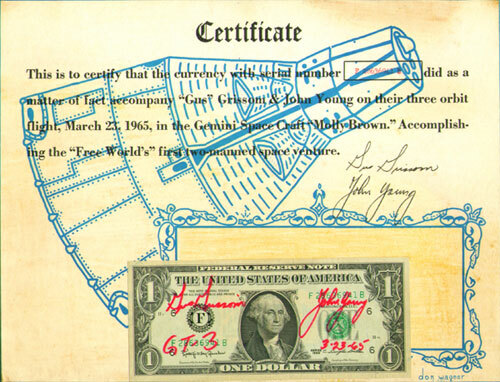 I was lucky enough to buy a GT 3 flown dollar bill and certificate recently. The currency has come loose from the certificate. Any suggestions as to how this should be reattached? Any general hints on conservation or preservation would also be greatly appreciated. There are archival semi-rigid clear sleeves that hold dollar bills. Currency collectors use them. You could maybe place the dollar in one of those and then mount it on the certificate, maybe using photo corners?? Thanks for your help, Brian. It is appreciated very much. I have a Dollar bill also that my father had. I have no idea what it is valued at. It is from the Apollo 7 flight but I do not have any back up showing that it did go into space. Can you tell me or send me info on how to find the value and also how to get info about it being real? See my posting on this message board and you can see a picture of it. The adhesive on the certificate is probably not archival. You should purchase 100% archival buffer paper (thin like bond paper) and cover just the glue area. This will create a barrier between the glue and the bill since the glue cannot be removed. You can then purchase an archival adhesive and put a small amount in each corner to adhere bill. The adhesive comes in a small container and you simple roll on a small amount. The adhesive is sticky like rubber cement but is not a liquid and can be rubbed off with a finger. The link below is where I purchase all the many archival products I use. Remember, use a metal frame, not wood, use OP3 museum acrylic, not glass, and 100% rag mat matt board if you mat it. You will then have a museum grade piece. There is an archival supply company called Gaylord Brothers that provides preservation materials to museums and the like. They are also on the internet at Gaylord.com. I'm sure they would have what you would need. I figure I am only a temporary custodian of a snall piece of space history and would like to make sure it survives so the next generation can enjoy it as well.